Thousands more South Tyneside homes and businesses can now access high-speed, fibre-based broadband as a direct result of South Tyneside Council’s investment into the multi million pound Digital Durham programme. A massive 98.6 per cent of homes and businesses in the borough can now access superfast broadband speeds, which is the highest coverage of all the North East local authorities. Across the borough, around 4,700 premises have been upgraded by engineers from Openreach, the business responsible for Britain’s largest phone and broadband network, since the first South Tyneside fibre broadband cabinet ‘went live’ in Jarrow, just over a year ago.This is in addition to around 58,500premises already upgraded as part of Openreach’s own commercial roll-out of fibre in the borough. Most recently, additional properties in Boldon Colliery, South Shields and Jarrow have joined those upgraded earlier in the roll-out in communities such as Whitburn, Hebburn, East Boldon, Bede Trading Estate and the Viking Industrial Estate. A further 368will be upgraded under current roll-out plans. Thousands of residents and businesses have ordered the new technology and are reaping the benefits of increased broadband speeds of to up to 80 Mbps1 - but that still leaves many people who have access to faster speeds but haven't yet upgraded. Welcoming the rapid progress, Cllr Ed Malcolm, Lead Member for Resources and Innovation at South Tyneside Council, said: “This is excellent news for the Borough and shows South Tyneside to be at the forefront of superfast broadband coverage for our residents and businesses. “Our work with the Digital Durham partnership and investment into the programme has ensured we have already surpassed the UK Government’s 95 per cent target and, as work continues to extend coverage further, more of our residents will have the opportunity to benefit from faster broadband speeds. 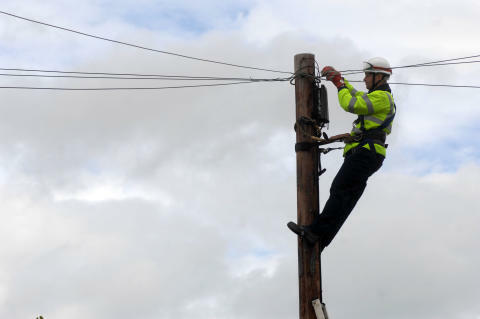 Derek Richardson, Openreach programme director for the North East, added: “Although South Tyneside is an urban area, work to boost speeds across the borough has been vital. The demand for faster, more reliable broadband speeds, driven by the ever increasing use of bandwidth-hungry devices, such as smartphones, tablets and even TVs, has never been greater. And that need for speed will only increase so ensuring South Tyneside communities can keep up is essential. Digital Durham is a partnership of ten local authorities - led by Durham County Council and BT Group - which aims to bring superfast broadband to homes and businesses in areas not included in commercial fibre rollouts. In total, £34 million has been invested in Digital Durham by Durham County Council, BT Group, the Government’s Broadband Delivery UK (BDUK) programme and public sector partners in South Tyneside, Gateshead, Sunderland, North Tyneside and Tees Valley. Tees Valley includes Darlington Borough Council, Hartlepool Borough Council, Middlesbrough Council, Redcar & Cleveland Borough Council and Stockton-on-Tees Borough Council.